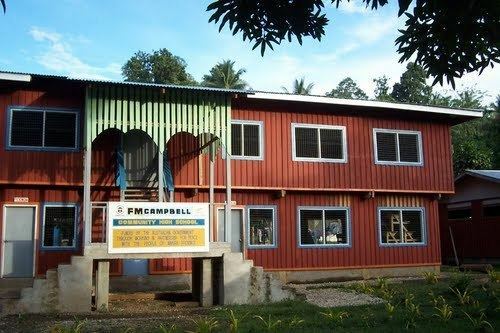 Makira-Ulawa Province is one of the provinces of the Solomon Islands. The main part of the province is Makira Island. It has a population of 40,419 (2009). The capital is Kirakira. Makira-Ulawa Province includes Makira (San Cristobal), Ulawa, Uki Ni Masi, Owaraha (Santa Ana), Owariki (Santa Catalina), Pio and others. Makira-Ulawa people are mostly Melanesian and their traditional dances and rituals are still strongly kept, especially in the islands of Santa Ana (Owaraha), Santa Catalina (Owariki), Uki-ni-masi and Ulawa. Makira Island, is 3090 km²: 139 km long by 40 km wide at around the centre of the island. Mountains run like a spine down the island's center: the highest point reaches 1040 m, then falls steeply to the sea along its southern shore. Many rivers penetrate the island in roughly parallel lines every two to five kilometers. Makira has more inland swamps—and saltwater crocodiles—than any other island in the Solomon Islands. Its coast is the only part of the Solomons where the rare Olive, or Pacific Ridley, turtle is known to visit and nest. Because Makira Island was isolated for long stretches of time during periods of high sea level, a wide variety of unique plants and animals evolved. For example, 12 of its 70 resident species of birds are endemic, as are two species of trees, both figs (Ficus cristobalensis and Ficus illiberalis). This uniqueness highlights the importance of preserving Makira's forest habitat. Makira is also among the most important islands in the country for birds. There are some bird watching spots on the island. At the village of Hauta, situated hundreds of metres above sea level, at the Bauro inland region an established conservation area exists. However, one requires a permission to visit, which can be acquired from the Provincial Office at Kirakira. On Makira, six languages are spoken: Arosi, Bauro, Fagani, Kahua, Owa en Tikopia. The Bauro speakers have been considered to be the most isolated and conservative of the Makira groups.